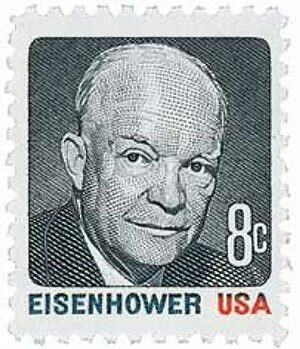 U.S. #1070 includes a portion of Eisenhower’s speech around the border. On December 8, 1953, President Dwight D. Eisenhower delivered his “Atoms for Peace” speech, introducing his goal of using nuclear power for peace. Eight years earlier, World War II came to a close with the detonation of two atomic weapons over Hiroshima and Nagasaki, Japan. With the war concluded, America’s top scientists and leaders knew that nuclear weapons and energy would have a tremendous impact on the future. U.S. #1394 – The International Atomic Energy Agency (IAEA) was created in 1957 as a direct result of Eisenhower’s speech. Connecticut Senator Brien McMahon (1903-1952) served as chairman of the Joint Committee on Atomic Energy. McMahon also authored the McMahon Act for the control of atomic energy, which resulted in the establishment of the Atomic Energy Commission (AEC) in 1946. The AEC directed the development and use of atomic energy for both military and civilian purposes. In August 1953, the Russians detonated their first hydrogen bomb, causing concern in America. President Eisenhower wanted to make Americans aware of the risks and benefits of nuclear technology, hoping to slow the nuclear arms race. 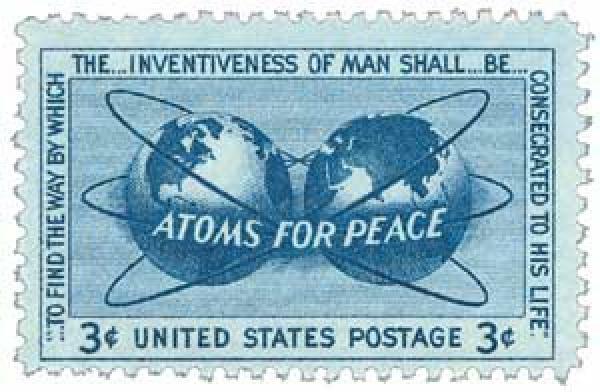 U.S. #2513 – Between 1957 and 1969, 22 people (including Eisenhower) received the Atoms for Peace Award. 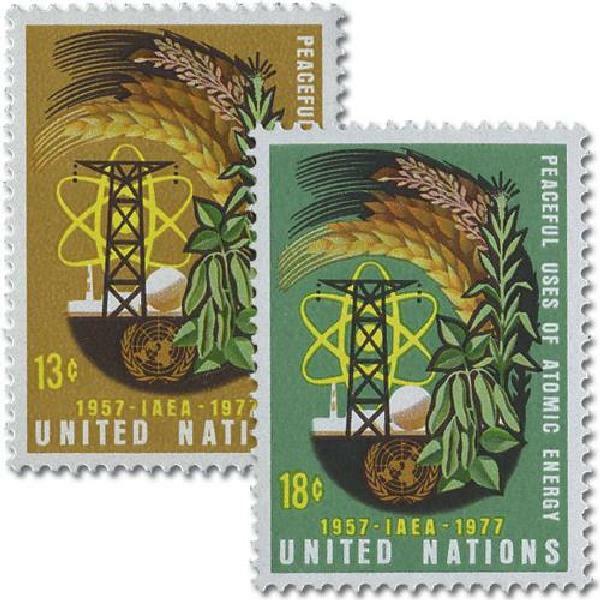 Item #UN289-90 – U.N. stamp issued to mark the 20th anniversary of the IAEA. The entire world was captivated by the proposal. Soviet ambassadors met with U.S. officials in Washington, D.C., and at a “Big Four” meeting the following January. 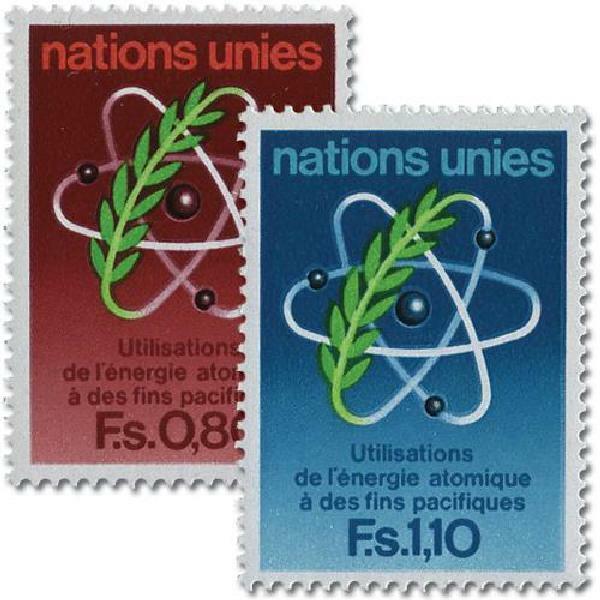 As a result, the International Atomic Energy Agency was created. The Atoms for Peace plan removed the veil of secrecy that had surrounded atomic development and opened research to civilians and countries that did not possess nuclear technology. The program also created regulations for the use of nuclear power and kept additional nations from developing weapons. It also led the way for treaties regulating nuclear weapons. Under the program, the U.S. exported highly enriched uranium to 30 countries to be used in reactors and for research. Item #UNG71-72 – A treaty prohibiting the spread of nuclear weapons went into effect in 1970. The IAEA is responsible for inspections that make certain this treaty is not broken. In 1962, the Nevada Test Site (now called the Nevada National Security Site) was also used to develop peaceful uses for nuclear energy. Since the 1992 nuclear test prohibition, the Department of Energy has used the site for testing hazardous chemical spills, emergency response training, conventional weapons testing, waste management, and environmental technology. 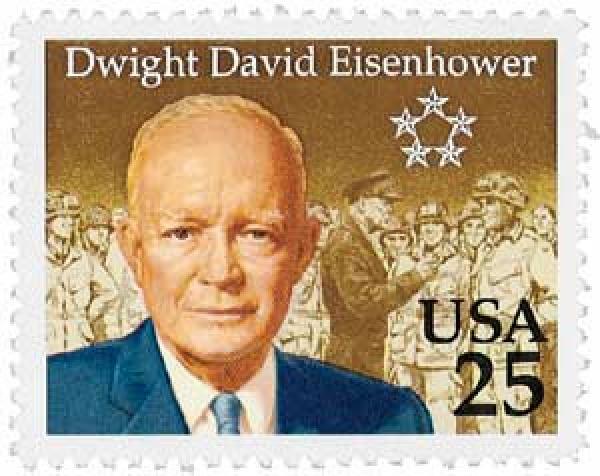 Read the full text of Eisenhower’s speech here. Or listen to it here. This entry was posted in December 2016, This Day in History. Bookmark the permalink. 4 Responses to "This Day in History… December 8, 1953"
Well, we see how well that treaty hasn’t worked after the fact. Great ideal, naive thought process. 1962 Nevada test site. We nuked ourselves 260 times- within our own borders! Guess that “peaceful” development didn’t work out so well. the use of nuclear energy. ATOM S FOR PEACE AWARD was instituted by Fort Motor company as a memorial to Henry Ford and Edsel Ford. James A Killian , President of Massachusetts Institute of Technology was appointed Chairman of Awards Committee. First Award went to Swedish Physicist Neils Bohr in 1957. The last (tenth) award was given away in 1969. Committee`s Executive Secretary Bryce Laggett`s collection of records and biographies of nominees are stored in M.I.T. ( one record carton, ten manuscripts boxes, one flat storage box ). Other Americans who were conferred this honor/award are Leo Szilard (awarded in 1959), Eugene Paul Wigner(1959), Alwin Weinberg (1960), Walter Henry Zinn , Edwin Mattison McMilan (1963), Isidor Issac Rabi (1967), Henry De Wolf Harry Smyth (1968), Aage Neils Bohr (1969), Ben Roy Mottelson (1969), and American President Dwight Eisenhower. Thank you MYSTIC for covering very very important topic of Atomic Energy for Peace . Correction It is FORD MOTOR COMPANY , Sorry for typographical error.